Foreigners always complain about Indonesians who do not walk in public space. They sometimes wonder why Indonesians walk for hours in a treadmill in gym but refuse to walk and insist on taking taxi. 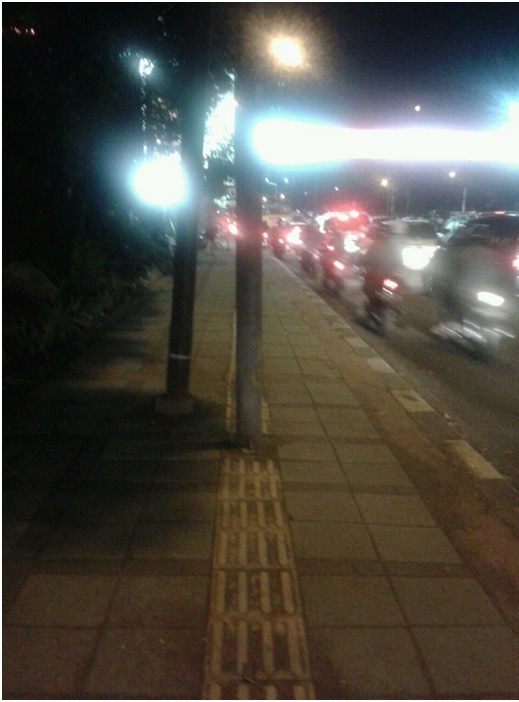 Most of the sidewalk in Indonesia is not safe, or should I say that most of the roads in Indonesia have no path walk. If we walk, it means we are endangering ourselves as we have to compete with cars and motorcycle. If the place has trottoir, like the famous Sudirman road at Jakarta, it is usually occupied by street vendors and ojek, motor taxi. The street vendors take some of the room and leave us with little space to walk (like the one in front of the Ministry of Education’s building). In this little space, we have to compete with ojek drivers too, who’s driving against the flow and is driving on the sidewalks. Walking for people with visual impairment in Jakarta is even harder. Yes the Indonesians, government are doing better by providing Braille guide block in the path way to guide them. However, there are not many people (particularly the street vendors and the builders itself) who are not aware that the guiding block is to help people with visual impairment and not to kill them. People with visual impairment should struggle to find the guiding block, avoid the street vendors and safe their life from getting hit by ojek. How safe and inconvenience is that? We also love to grab taxi, even if it is only walking distance because it really is convenience. The AC keeps us for sweating at the very low price, flag fall for regular taxi in Indonesia is only 50 cents. Plus, we are helping the taxi driver company to get money. So we are killing two bird using one stone, being generous and convenience lazy at the same time. The people in smaller city usually walk more, and those who do not like to walk, could always grab rickshaw. I guess we are raised to avoid walking. There are of course Indonesians who love to walk, they are Badui people. Often called as Orang Kanekes, Badui is a native tribe from Banten who walk all the time. Badui people preserve their customs by refusing any modernization including means of transportation, water and sanitation, electricity, education, but they do accept money. They are so committed to walk, well their village behind the hills (yes hills) could only be accessed by walking. These people are often visit Jakarta by foot to sell honey and other handicraft. If normal Indonesian spend a day to reach their village, Badui people only spend one day or two to reach Jakarta. There are also the modern versions of people who like to walk; they are the mall-goers. Go to visit one of the malls in Jakarta and observe how Indonesians committed to walk wearing high heels around the mall and window shopping. One should make sure that the AC in the mall works, because if not, they will stop walking and go home. Again, appearance is everything and sweat on the armpits is sinful. I was recently on mission with some VIPs to one of the capital cities in Indonesia. The car that was supposed to pick us was not able to enter the area due to the traffic. We then walked because the car parked not far from the exit door. The organizers considered this as an incident and profusely apologize for “the inconvenience”. I guess in our culture, it is sinful to let VIPs walk even for less than 5 minutes. To conclude, Indonesia do walk, but only in the mall, when travelling to Bali or abroad. This is because the path walk is often better, there is less pollution and most importantly, there’s no flat dead rat on our way. Do you walk? Do you know about guiding block?